A lot of people wonder how Chinese parents raise such stereotypically successful kids. They wonder what Chinese parents do to produce so many math whizzes and music prodigies, what it's like inside the family, and whether they could do it too. Well, I can tell them, because I've done it... Amy Chua's daughters, Sophia and Louisa (Lulu) were polite, interesting and helpful, they had perfect school marks and exceptional musical abilities. The Chinese-parenting model certainly seemed to produce results. But what happens when you do not tolerate disobedience and are confronted by a screaming child who would sooner freeze outside in the cold than be forced to play the piano? 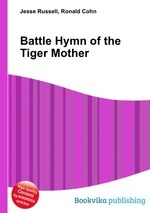 Battle Hymn of the Tiger Mother is a story about a mother, two daughters, and two dogs. It was supposed to be a story of how Chinese parents are better at raising kids than Western ones. But instead, it's about a bitter clash of cultures, a fleeting taste of glory, and how you can be humbled by a thirteen-year-old. Witty, entertaining and provocative, this is a unique and important book that will transform your perspective of parenting forever.